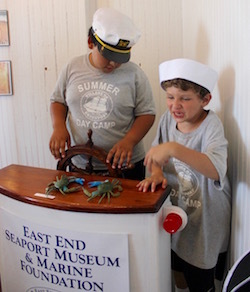 Greenport’s East End Seaport Museum, which long has provided nautical educational activities for kids, has now taken the immersive educational experience one step further, opening up a brand new children’s room on Aug. 4. 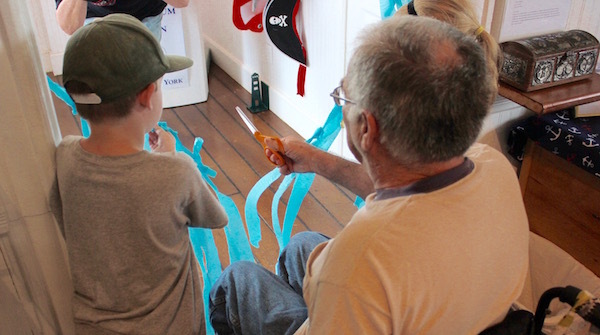 The room, named “Captain Bob’s Quarter Deck” for Bob Jester, who volunteered to chair the museum’s children’s room committee, is dedicated as a “children’s please-touch-and-explore nautical experience,” according to the museum’s Chairwoman, Arlene Klein. 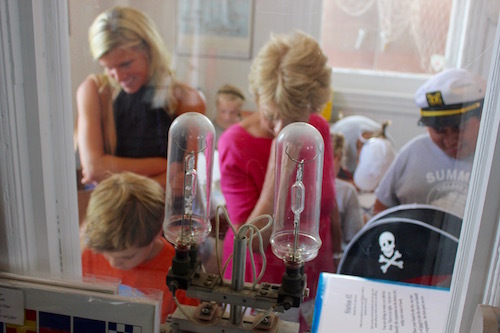 It is housed in the west wing of the museum, which had formerly been exhibition space that has now been transformed into a light-filled room with supplies for educational programming, including nautical-themed games, arts and crafts supplies and a kid-sized captain’s wheel built by museum board member and boatbuilder Otto Schoenstein, with costume supplies nearby for kids to pretend they are running a ship. 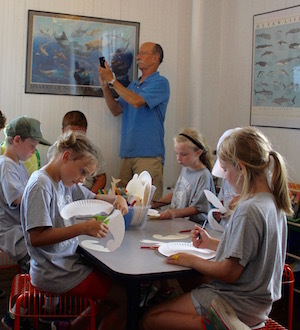 Retired teacher Bob Jester gives a lesson in induction at the grand opening of the seaport museum’s room named in his honor. 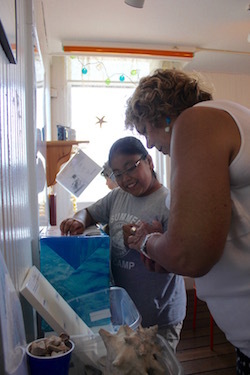 The museum is planning to soon host fiddler crab races and will soon install marine life touch tanks in the room, while Greenport Kindergarten teacher Allison Riddell and Riverhead High school physic teacher Kim Skinner have worked with Mr. Jester to help design the space and put together several dozen educational activities. Mr Jester gave kids from Greenport Village’s summer day camp in attendance at the opening a lesson in human electric conductivity by asking them to stand in a circle and hold hands, introducing various items that did or did not conduct electricity into the loop, before cutting a blue ribbon at the entranceway to the children’s room and setting the kids loose inside. Mr. Jester had just learned recently that the room was being named in his honor. He said that, while teaching in the Riverhead School District, he’d always dreamed that they may name a room there after him, but over the past year, he’s realized that’s not the most important thing. “I want my name written in the hearts and minds of the kids. I hope that room gets so crowded and keeps changing and changing to meet the needs of the community,” he said. The room through Bug Light’s bulbs.